Perhaps the greatest challenge to sustainability is Global Climate Change (GCC). Burning fossil fuels releases carbon dioxide (CO2), a known greenhouse gas, into the atmosphere. This has led to a steady rise in the concentration of CO2 in the atmosphere. At the same time, average global temperature has risen 0.76°C (1.4°F) since 1850, a phenomenon known as Anthropogenic Global Warming (AGW). “Business as usual” models project global temperatures to rise an additional 3°C (5.4°F) by 2100. The consequences of such rapid and dramatic global change are largely unknown, but preliminary estimates suggest that sea level will rise a little over 3 feet by 2100, and that weather hazards will become more severe. Economic losses are estimated in the trillions of dollars and loss of life in the hundreds of millions. A 3°C rise in average global temperature could put 30-50% of plants and animals at risk of extinction (IPCC 2007). Risks can be magnified if global climate passes a tipping point that leads to irreversible change. The high level of uncertainty about the effects and consequences of GCC demands that we apply the precautionary principle and reduce carbon emissions. In this blog post we will review the theory behind AGW and the supporting evidence. GCC has happened often during earth’s long history. Much of what we know about these changes comes from the study of ancient climates as preserved in rocks, sediments, and ice cores. These changes resulted from natural processes such as variation in solar output, in the earth’s orbit around the sun, in the spatial distribution of the continents, in oceanic circulation patterns, and the rates of volcanic activity. However, never has climate change resulted from human activity, until now. The greenhouse gas carbon dioxide (CO2), which is emitted during burning of fossil fuels, is believed to be responsible for a sudden rapid increase in average global surface temperatures in the last century. 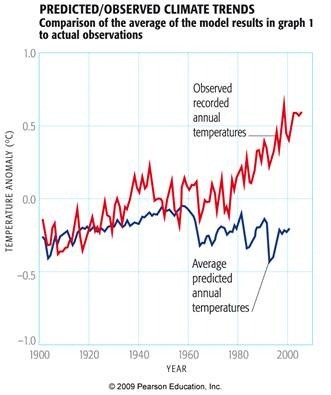 Average global temperature has risen by 0.76°C (1.4°F) since 1850 and is projected to increase another 0.5-1.0°C (0.9-1.8°F) due to greenhouse gases we have already added to the atmosphere (Dawson and Spannagle 2009). These changes are irreversible over a timescale of 1,000 years because it would take longer than 1,000 years for the artificially warmed oceans that moderate climate to cool off (Solomon, Plattner et al. 2009). Because the rate of temperature change is greater than at any other time in the last 22,000 years when natural processes determined the global temperature (Joos and Spahni 2008), we infer that a new, non-natural process is responsible for these changes, so we name it anthropogenic global warming (AGW). The idea of global warming is really quite simple. Energy in sunlight passes through earth’s atmosphere and heats the surface, which warms and gives off heat. Without greenhouse gases like CO2 in the earth’s atmosphere, that heat would radiate into space and be lost, and the average surface temperature of the earth would be only -18°C (0°F), meaning that all water on the earth’s surface would be frozen (Faure 1998). Life would not be possible. Fortunately, the greenhouse gases in our atmosphere absorb and trap the heat, increasing the average observed surface temperature of the earth to a very hospitable 15°C (59°F). We are fortunate to have greenhouse gases in our atmosphere. However, like Goldilocks we need it not too cold and not too hot, but just right. If the concentration of greenhouse gases gets too high, it will be too hot for us. Figure 1. Atmospheric concentration of carbon dioxide at Mauno Loa, Hawaii, USA (ppm) and average annual global surface temperature anomaly (°C) between 1958 and 2010. 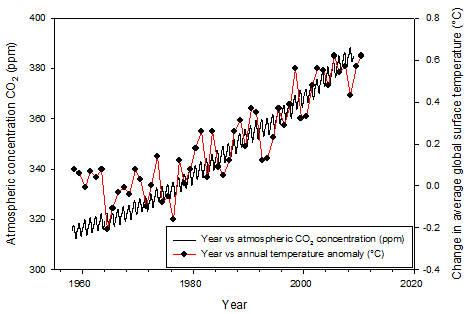 Temperature data from Hansen (2010), atmospheric CO2 concentration data from Keeling (2009). The molecule CH2O represents the organic matter that stores the energy in fossil fuels. When we use fossil fuels, we undo the work of photosynthesis, promoting the reverse reaction by heating the organic matter in the presence of atmospheric oxygen so that they react and liberate the stored energy, a process called combustion. The troubling product of this combustion is CO2, which accumulates in earth’s atmosphere, leading to the observed steadily increasing atmospheric CO2 concentration (Figure 1). Equation (1) illustrates the delicate balance between plant photosynthesis (forward reaction) and combustion (reverse reaction) that determines the concentrations of oxygen and carbon dioxide in the earth’s atmosphere. From Eq. 1 above we can see that combustion consumes O2 while producing CO2. Thus, we would predict that increasing CO2 concentration should be balanced by decreasing O2 concentration in the atmosphere, which is what we observe (IPCC 2007). The current atmospheric O2 concentration of 21% is just right for trees: If O2 rose to 25%, forests would burn after every lightning strike, but if it fell to 13%, we could not start a fire. In fact, it is life that regulates the composition of the atmosphere, as illustrated vividly by James Lovelock’s conception of Gaia. He posits that earth behaves like an organism because its components act in concert to maintain life-support systems at optimal levels. Just as our body maintains a constant temperature of 98.6°F, the earth can maintain global temperatures within a narrow range that is conducive to life. How does it accomplish this? Eq. (1) gives us some insight. Because temperature positively correlates with atmospheric CO2 concentration, when CO2 is increased, then temperature increases, and these changes combine to create a greenhouse that promotes plant growth through photosynthesis (Eq. 1). This causes plants to extract greater amounts of CO2 from the atmosphere, decreasing atmospheric CO2 concentration and therefore temperature. This is an example of a balancing negative feedback loop. Thus, life helps to regulate the composition of the atmosphere and maintain an optimal temperature, and the earth system of which life is a part is self-regulating (homeostatic). Essentially, the solid earth and atmosphere (geochemistry) and life (paleontology) have co-evolved. Increasing concentrations of this weak acid cause the pH of seawater to decrease. This is a major problem for organisms that extract Calcium Carbonate (CaCO3) from seawater to build shells, because Calcium Carbonate dissolved readily in acidic water. Coral reefs are the backbone of coastal marine ecosystems that have very high biodiversity, yet these reefs are rapidly dying across the world’s oceans, in part due to ocean acidification. How sad that these corals, which have been some of earth’s most successful creatures, having survived for hundreds of millions of years, now face extinction because of anthropogenic CO2 emissions. If the world’s coral reef ecosystems collapse, so will most of the world’s coastal fisheries, leading to the loss of the primary protein source for most low-income coastal communities. How do scientists know that the excess CO2 in the atmosphere did not come from decaying plant matter or burning of modern vegetation? Because the proportion of atmospheric carbon that is radioactive 14C has been declining steadily, indicating that ancient carbon is being added to the atmosphere[i]. How do we know that the CO2 didn’t come from volcanoes? Because the 13C/12C ratio of the atmosphere has been steadily decreasing. Volcanic CO2 has high 13C/12C, and only plant matter has low 13C/12C, so the decrease in atmospheric 13C/12C must come from burning plant matter[ii]. So we can agree that CO2 is a greenhouse gas, and that human activity has increased the CO2 concentration in the atmosphere. This should lead to warming of the atmosphere, which will thermally equilibrate with the land surface and oceans through heat transfer, causing them to also warm. Thus, the entire earth will warm, as is evident in (Figure 1). The rate of heating was higher in the last 25 years than over the previous 150 years. This acceleration of warming to rates higher than ever recorded in geologic history is what has scientists concerned (Joos and Spahni, 2008). Global warming is documented by many global changes. Instrumental records (corrected for the urban “heat island” effect) and natural evidence (shrinking and thinning of Arctic ice, loss of Antarctic ice shelves, and receding of most Alpine glaciers globally[iii]; lengthening of growing seasons, migration of animals and plants to higher latitudes, and borehole measurements) all show that the earth’s surface has warmed 0.4-0.8°C (~1°F) during the 20th century. The probability that warming is real is > 99% (IPCC 2007). For example, the warmest eight years recorded since record-keeping began about 150 years ago all occurred within the twelve years preceding 2011. In fact, since 1850 the 24 warmest years have been as follows, from warmest to coolest: 2010, 2005, 2009, 2007, 2002, 1998, 2003, 2006, 2004, 2001, 2008, 1997, 1995, 1990, 1991, 2000, 1999, 1988, 1996, 1987, 1983, 1981, 1994, and 1989. The 24 warmest years have all occurred since 1980. It is nearly impossible for these observations to occur by chance. It’s also important to know that CO2 is not the only important greenhouse gas; others include methane CH4, Nitrous Oxide N2O. Together, these gases increase the average global surface temperature by 34°C. The heating power of a greenhouse gas (radiative forcing) is proportional to the reduction of infrared radiation leaving earth caused by a unit increase in concentration of gas in the atmosphere. The cumulative effect of a greenhouse gas depends on its radiative forcing and how long it stays in the atmosphere, termed the “residence time.” The total Global Warming Potential (GWP) therefore depends on both the radiative forcing and residence time of a GHG in the atmosphere (scale normalized to CO2): CO2 = 1, CH4 = 21, N2O = 290, CFC’s = 3000-8000 (Faure 1998). GHG emissions are usually reported as CO2 equivalents CO2e. So, for example, emission of 1 kg of CH4 would be equivalent in terms of GWP to 21 kg of CO2, so CO2e = 21 kg. The GWP of CFCs are large because their atmospheric concentrations are near zero, they absorb infrared radiation between 8000-12,000 nm where CO2 is ineffective, and they have long atmospheric residence times (Faure 1998)[iv]. 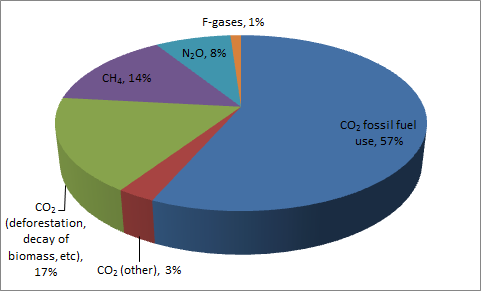 (Figure 2) compares the relative importance of GHGs to global warming by plotting the percentage of total CO2e associated with each type of GHG emission. Although CO2 is the weakest of the GHG, it has the largest effect on global warming because we emit such large volumes of CO2 during fossil fuel burning. Thus, AGW mitigation measures must first focus on reducing CO2 emissions. Of course anthropogenic GHG emissions are not the only cause of GCC. Natural causes of GCC include variable sunlight intensity, strengthening greenhouse, increased atmospheric aerosols, and volcanic eruptions. Computer simulations based on real-world measurements show that the natural drivers, solar variability and volcanic eruptions, have actually caused earth’s surface temperature to decrease during the 20th century. Aerosols also cause cooling. As a result, observed global surface temperatures cannot be explained by natural forces alone (Figure 3). Therefore, the only remaining cause of global warming is increased greenhouse gas concentration from fossil fuel burning. (Figure 1) shows an excellent positive correlation between atmospheric temperature and CO2 concentration from 1880 to the present, consistent with the idea that increased CO2 is associated with increases in temperature. Data from ice cores collected in Antarctica demonstrate that this correlation stretches back 420,000 years (Petit, Jouzel et al. 1999). Plotting CO2 concentrations versus temperature anomalies recorded in the ice cores demonstrates that the trend for the “Anthropocene” is distinctly different from the natural trend, showing unequivocally that the atmosphere-climate system has been highly perturbed by human activities (Figure 4). 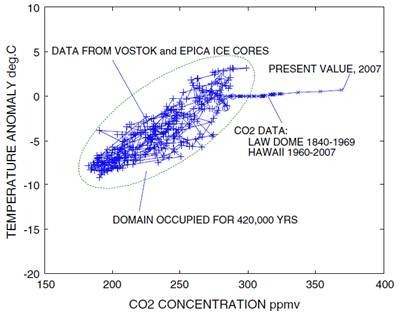 The positive correlation between temperature and atmospheric CO2 concentration shown in (Figure 1) and (Figure 4) suggests, but does not prove, a cause and effect relationship[v]. However, we can say with a high level of confidence that when atmospheric CO2 concentration is high, average global surface temperatures are high, and since the atmospheric CO2 concentration is now higher than at any time during the past 420,000 years, we can expect that temperatures will rise to levels higher than at any time during the past 420,000 years as the global climate system adjusts to the new, higher level of CO2 in the atmosphere. Figure 3. Comparison of average global surface temperatures that were observed with those predicted by models that accounted only for natural climate forces and not human forces. From Mann and Kump (2009). Figure 4. State–space view of Antarctic ice-age cycles. From Etkin (2010). Archer, D., M. Eby, et al. (2009). The Atmospheric Lifetime of Fossil Fuel Carbon Dioxide. Annual Review of Earth and Planetary Science. 37: 117-134. Dawson, B. and M. Spannagle (2009). The Complete Guide to Climate Change, Routledge. Etkin, B. (2010). “A state space view of the ice ages—a new look at familiar data.” Climatic Change 100(3): 403-406. http://dx.doi.org/10.1007/s10584-010-9821-x. Faure, G. (1998). Principles and applications of geochemistry: a comprehensive textbook for geology students, Prentice Hall. Hansen, J. E., R. Rued, et al. (2010) “NASA GISS Surface Temperature (GISTEMP) Analysis.” Trends: A Compendium of Data on Global Change DOI: 10.3334/CDIAC/cli.001. http://cdiac.ornl.gov/trends/temp/hansen/hansen.html. IPCC (2007). Climate Change 2007: The Physical Science Basis. Contribution of Working Group I to the Fourth Assessment Report of the Intergovernmental Panel on Climate Change. Cambridge, U.K. and New York, NY, USA, Cambridge University Press. Keeling, R. F., S. C. Piper, et al. (2009) “Atmospheric CO2 records from sites in the SIO air sampling network.” Trends: A Compendium of Data on Global Change DOI: 10.3334/CDIAC/atg.035. http://cdiac.ornl.gov/trends/co2/sio-keel.html. Mann, M. E. and L. R. Kump (2009). Dire Predictions: Understanding Global Warming. New York, DK Publishing, Inc.
Petit, J. R., J. Jouzel, et al. (1999). “Climate and atmospheric history of the past 420,000 years from the Vostok ice core, Antarctica.” Nature 399(6735): 429-436. Solomon, S., G.-K. Plattner, et al. (2009). “Irreversible climate change due to carbon dioxide emissions.” Proceedings of the National Academy of Sciences 106(6): 1704-1709. http://www.pnas.org/content/106/6/1704.abstract. [i] 14C has a half-life of 5700 years, so plant matter that is older than roughly 6 half-lives or 8*5700=45600 years has essentially no 14C. [ii] Note that it is the changing 14C content of the atmosphere that makes accurate 14C dating of material less than 100 years old impossible. [iv] Some confusion about GWP values exists because they are sometimes quoted for different timescales. Some studies only look at a 100 year timescale and find that the GWP of CH4 is 73, i.e., methane is 73 time more potent than carbon dioxide. However, if we take the longer term view required by sustainability of, say, 1000 years, the GWP of CH4 drops to 23 because CO2 persists in the atmosphere longer than methane. See Archer, D., M. Eby, et al. (2009). The Atmospheric Lifetime of Fossil Fuel Carbon Dioxide. Annual Review of Earth and Planetary Science. 37: 117-134. [v] One complication is that, when viewed at high temporal resolution, ice cores show that atmospheric CO2 increases lag behind temperature increases by several centuries, possibly suggesting that increased temperatures cause high atmospheric CO2 rather than the reverse. However, there is a good explanation for this relationship, one that relies on increases in solar insolation to trigger warming episodes that then become amplified by increases in atmospheric CO2. Variations in insolation (solar intensity) due to Milankovitch cycles are not sufficient to explain the large (6° C) temperature variations of the ice ages. However, they can trigger temperature excursions. If insolation increases, then atmospheric temperature will increase slightly. This causes the solubility of CO2 in seawater to decrease; the ocean begins to add CO2 to the atmosphere, which further increases temperature due to the greenhouse effect, which leads to more degassing, creating a positive feedback loop. This is reinforced by another positive feedback loop in which continental ice sheets melt and recede, exposing land with a lower albedo, leading to increased absorption of solar radiation and heating. The oceans take about a thousand years to overturn and degas, so the CO2 concentration in the atmosphere will not peak until roughly a thousand years after the heating episode began. This entry was posted in Global climate change, Global warming, Sustainability and tagged Global climate change, Global warming, Sustainability. Bookmark the permalink.